Not sure if you have noticed but all the Blockbusters have gone away and they have been replaced by Redbox. Is that a good thing? YES, Blockbuster has gone the way of the DoDo bird. We love Redbox at Discount Movie Passes because of the cheap pricing. 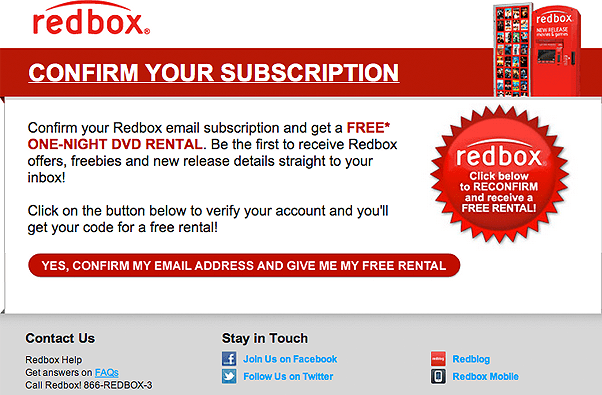 DVD’s rent at Redbox rent for $1.30 per night which includes tax. Blu-ray discs at Redbox are priced at $1.63 per night. And Redbox also rent games for XBOX 360, Wii, and PS3. Game rentals at Redbox are priced at $3.80 per night. You can either reserve and search for a rental in the store at their Kiosk’s or search online and reserve and pickup at the store. On this step I would put in a cell if have a plan which allows you free text messaging I get several messages a month with discount codes or free rentals just by Redbox sending me txt messages. Yeah, more free movies. Make sure to watch your email for your confirmation email so you can confirm your email and get your free movie or game rental.